It is with great pleasure that the Seabrook Educational Cultural Center (SECC) and the Seabrook Chapter of the Japanese American Citizens League (JACL) announce the selection of NORMAN Y. MINETA to receive the 2017 John Fuyuume Citizenship Award. The award was established by SECC to honor an individual for their lifetime of service. The award honors Americans whose outstanding achievements in different fields of endeavor have received regional and/or national recognition and whose contributions have added to the sum of human knowledge and/or enhanced the quality of life in our society. 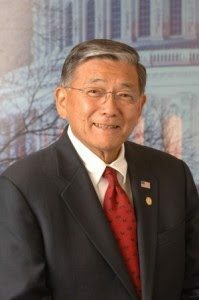 Secretary Norman Y. Mineta’s career in public service has been both distinguished and unique. He served in Congress for over twenty years and was appointed to the Cabinet of both Democratic and Republican presidents. Secretary Mineta and his wife, Deni, plan to attend the Seabrook Obon Festival on Saturday, July 15, 2017 and will be present at the John Fuyuume Citizenship Award Luncheon. The John Fuyuume Citizenship Award will be presented at the Ramada Inn (Vineland, NJ) Banquet Hall 12:30-3:00PM, Sunday, July 16, 2017.